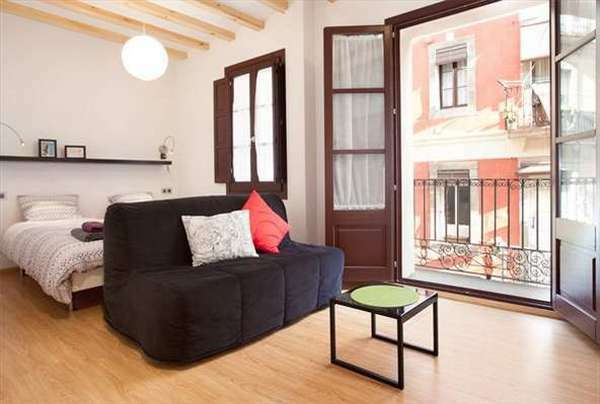 This Barcelona apartment is located in La Barceloneta, one of the most charming areas in the city. It is only a 5 minute walk to the beach and just a 10 minute walk or a short metro ride to the city centre. The building is located on a quiet pedestrian street, with many tapas bars and seafood restaurants around. In the case that you will arrive by car, there is a public car park next to the building. The building itself has been renovated but keeps the traditional characteristics of the Barceloneta neighbourhood. Once inside, the apartment is furnished in a comfortable yet modern style with parquet flooring. It also maintains a touch of local authenticity with its wooden window frames and original ceiling beams. The American kitchen is compact but fully equipped with all of the appliances and utensils you will need to prepare your home-cooked meals. There is also a folding dining table and chairs, seating four people. Barceloneta Market is at the end of the street, only a few steps from the building, and there you can buy your fresh ingredients. Accommodating up to four people, this lovely apartment has two single beds as well as a double sofa bed. It also has an Internet connection and a TV. With both heating and air-conditioning, this apartment provides the perfect living space at any time of year!